“Chalfont St Giles” and “jazz” are words that one might not expect to find in the same sentence. 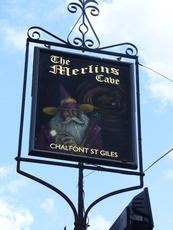 But Merlin’s Cave, a pub adjacent to a quintessentially English village green in Buckinghamshire, has been the scene of well over a thousand jazz sessions since the 1980’s. Since its inception, the club has regularly presented established stars like Stan Sulzmann, up-and-coming players such as Sam Mayne and, more occasionally, overseas visitors of the calibre of Michael Hashim. The music, which begins just after midday every Sunday, has been convened by bass player Peter Hughes for over two decades. For a long time, a different soloist each week played with a house trio led by pianist John Clark (later Bill LeSage) but now the headliner is encouraged to recommend his own sidemen, to improve compatibility between the musicians and increase variety for the audience. Peter Hughes has built up an astonishing contact-book and even top names wait for months before they get a gig. There is little doubt that jazz at Merlin’s would not have thrived for so long without his dedication and hard work. 1 September: Al Nicholls (tenor saxophone), with Richard Busiakiewicz (electric piano), Peter Hughes (bass) and Paul Robinson (drums). Al Nicholls is a big-toned swing saxophone player. He leads his own group and is a veteran of the bands of TJ Johnson, King Pleasure and Ray Gelato. 8 September: Alan Barnes (saxophones), with Jack Emblow (piano accordion), Peter Hughes (bass) and Jon Scott (drums). A regular visitor to Merlin’s and a great favourite with the crowd, Alan Barnes needs no introduction. His appearance alongside the accordion legend will guarantee musical fireworks and verbal wit. 15 September: Nadim Teimoori (tenor saxophone), with Peter Hughes (bass), others to be confirmed. Nadim Teimoori is a fast-rising and hugely talented young player, championed by Stan and Clark Tracey. 22 September: Paul Eshelby (trumpet), with Geoff Eales (electric piano), Peter Hughes (bass) and a drummer tbc. A fine trumpeter and celebrated educator, Paul Eshelby has worked in various contexts with a lengthy list of great singers and musicians from around the world. 29 September: Derek Nash (saxophones), with Peter Hughes (bass), others tbc. The ebullient, ubiquitous Derek Nash has led exciting bands including Sax Appeal for many years, and features prominently in Jools Holland’s Rhythm and Blues Orchestra. It all takes place in the barn, a few steps across the car park of the pub. Wobbly tables and dodgy chairs are scattered around a venue that is small in size but big in character. The gas heaters – essential most of the time in the uncarpeted room - are still cursed by Benn Clatworthy almost a decade after he burned a hole in a new pair of trousers. For years, an enormous grey cobweb hung over the stage like a cloud, but it was mercilessly removed during a refurbishment in 2007 that did little to improve the room’s cosiness. The discomfort is irrelevant though; it’s all about the music. The enthusiastic and knowledgeable audience is extremely loyal and many of the locals (frequently with blankets on their knees!) sit in the same seats every week. New visitors are genuinely and warmly welcomed at Merlin’s. They are also needed by the musicians, because the only funding is the cash taken at the door and it is not unusual for fewer than two dozen people to turn up. A bigger turnout means that the top professionals who perform there stand a better chance of going home with more money than they came with. And a larger crowd is a warmer crowd. The September line-up will prove once again that Merlin’s Cave is a great little place to hear jazz. Admission is £5; doors open at 12 noon.